Manhattan User's Guide. When I moved to New York from Paris in 1997, I subscribed to a newsletter called Manhattan User's Guide. It told you stuff like where to go out to dinner, who to call when you had a plumbing problem, and what was on sale where. Sadly, it went out of business a couple of years later, but it was resurrected in February 2003 as a free website. Dinner Broker and Open Table. These are two reservation services that will help you get restaurant seats in major cities. Dinner Broker not only makes reservations at the restaurants in its network, but it can get you a discount during slow times and, for a premium, can get you seated at otherwise full spots during peak hours. Open Table specializes in high-end restaurants, and you earn points that can be redeemed for dining certificates. Each company works with restaurants that have signed up for its services. Empire State Building Lighting Schedule. In case you're wondering what the colors mean. Hop Stop This site does for public transportation what MapQuest does for driving directions: You tell it where you are and where you are going, and it gives you directions by subway/bus/foot for getting there. New York is up and running, and as of early 2006, there were beta versions for Boston, San Francisco and the District of Columbia. Internet Slang Dictionary & Translator Just what it says; you type in web/phone text slang, it tells you what it means. Doesn't know the old wire-service codes, but idk, wfm though ymmv. Am I Annoying? One Saturday morning, I turned on the TV and there was an infomercial with Billy Mays shouting at the top of his lungs about Orange Clean. I like that product, but I wondered who the hell Billy Mays was and what qualified him to scream about household cleaning products on the cable TV I was paying too much for. So I Googled him and came across this website, which has thousands of quick bios of the famous, the near-famous and the famous-for-being famous, including an even-handed analysis of why they might or might not be annoying. Billy's name annoys other people too -- no Giant he, not even a Met -- but he has a cult following among a certain substratum of gay culture who consider him a "bear," which if you've ever seen him (and if you have a TV, how could you not?) you'll understand why. Where else can you learn these things but the Internet? Building-Cost.net. This site lets you estimate the cost of building a home anywhere in the United States. It has enough variables to be useful but it only takes a few minutes (good if you have a book of plans and want to figure out what they will cost to execute). Dictionary.com Who uses printed dictionaries anymore? Power Reporting. A site for journalists, but anybody can use it. Best for the people finders if you're looking for somebody. Urban Legends. Next time you get a petition by email, check here to see if it's real. This site also debunks all kinds of allegedly common knowledge. Paul is dead? At the end of Strawberry Fields, Lennon said "cranberry sauce." Public Records On-Line. There aren't all that many of them yet, but this site keeps you up to date on what there is. A Plan for Spam. This is a speech given in the summer of 2002 by Paul Graham, a programmer who is creating a spam filter based on probability principles described by Thomas Bayes, an 18th-century British minister. The speech is interesting because it seems like Graham has come up with a good method of limiting spam while not filtering out messages you might want and also because it gives some insight into the techniques of spammers. If you are wondering about Thomas Bayes, whose ideas have applications in web searching, here is an article that I edited about him for the International Herald Tribune's Money Report in 1999. You can read the rest of the section here. Taking on Prostate Cancer. This is a 1996 article by Andy Grove, the chairman of Intel Corp., about his experience with a diagnosis of prostate cancer. The medicine may be out of date, but if you are worried about any kind of unnecessary surgery, it is a must-read. Grove investigated alternatives to surgery, which was strongly recommended by his doctors, and ended up having successful radiation treatment. This had far fewer side effects than would have been the case with surgery. Grove is a genius and a billionaire, which put him in a better position than most people to challenge the medical estabishment. Max Funds. An excellent place to research (American) mutual funds, and the 50s-style design is visual comfort food. I interviewed the founder once, his advice was pretty good. Marketocracy. This is a kind of game for would-be mutual-fund managers. If you are looking for investment ideas, you can piggyback on the most-popular stocks. I run a portfolio based largely on articles I have written or edited. Social Security Benefits calculator. This is a program that you download (Mac or Windows) and run on your computer, using data from the annual statement that the Social Security Administration sends out. It is especially useful for Americans who worked overseas (or foreign nationals who worked some years in America) and want to plan for retirement. Know your journalists. A 2003 demographic study of American journalists. My articles for the International Herald Tribune: you can see a list of the 500-odd articles I wrote for the Trib after mid-1991 by clicking here. My first big project for Forbes was the 2003 A-List, our list of the 400 best big companies in the world. I did a short video interview to support it. The Bronx Board. For displaced, misplaced, and nostalgic ex-Bronxites. We're special. 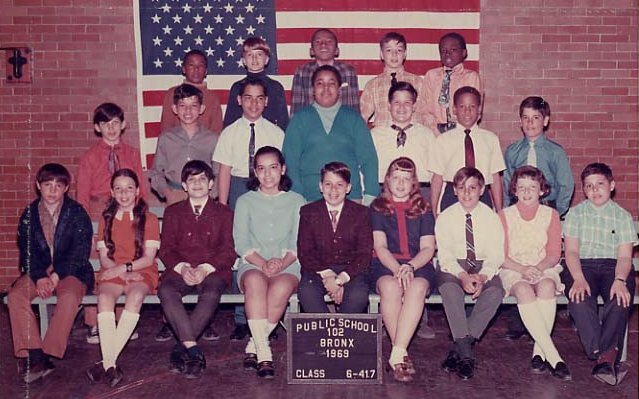 See a picture of my sixth-grade class. I'm on the bottom right. Want to live in a manufactured home community in Arizona? Then take a look at Mitchell Martin and George Arnold Desert Sky Ranch. If Gainesville, Florida, is more your speed, there is a Mitchell Martin who is a real estate broker there. Through no fault of my own, Mitch Martin is the name of a character in the movie Old School. Also in the entertainment world, there is an actor named Kevin Mitchell Martin.